John James "Jean" Charest (born 24 June 1958) is a French Canadian politician. He was Premier of Quebec from 2003 until 2012 under the Quebec Liberal Party. Charest was born and grew up in Sherbrooke. Before politics, he worked as a lawyer. He received his diploma from the University of Sherbrooke in 1981, and was admitted to the Bar of Quebec the same year. After 3 years of working in court, Charest decided to join the Conservative Party of Canada in 1984. He was only 26 years old when he was elected as the representative of Sherbrooke. 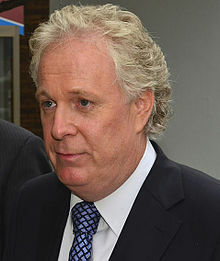 Jean Charest had joined the Conservative Party of Canada in 1984. In the same year, he was appointed as Assistant Deputy Chair of Committees of the House of Commons.Invalid <ref> tag; invalid names, e.g. too many He was given the job of Minister of State for Youth. Charest was re-elected in 1988, and served as Minister of State for Fitness and Amateur Sport. In 1984, the Prime Minister of Canada, Brian Mulroney, promised that Quebec would sign the Canadian Constitution, which every other province had already signed two years before. Jean Charest was very involved in this project, but it did not succeed. In 1995, Quebec was governed by the Parti Québécois, who started a referendum about whether Quebec should stay as a part of Canada. In others words, the population had the choice of staying or leaving the country. Jean Charest was against the idea of Quebec leaving the union. The results were very close, but Quebec stayed as part of the country. Régis Labeaume, Stephen Harper and Jean Charest at the Forum mondial de la langue française, July 2 2012. During the 1990s, the sovereignty movement was at its height. Jean Charest, who was a big part of the No campaign in 1995, had won the support of many federalists from Quebec. This is why he joined the Liberal Party of Quebec in 1998, as the leader of the party. In 1998, Charest participated at his first election as a leader of a party. He received more votes than his opponent, but did not reach the majority. He stayed as official Leader of the Opposition until 29 April 2003. Charest won the next election and became Premier of Quebec on the 29 April 2003 by receiving 45.99% of the votes from the electors. Mario Dumont from the Action Démocratique du Québec and Bernard Landry from the Parti Quebecois were his opponents. The Liberal Party won 76 out of 125 seats. During his government, there were crises with the housing industry and university funding. Charest was not able to lower taxes as he had promised during his campaign. In the 2008 election, the Liberal Party under Jean Charest got re-elected as the government, with 66 out of 125 seats and 42% of the votes from Quebec's electors. Charest himself was less popular in this election than the other one before. He gained 33.08% of the votes from the electors. The popularity of Jean Charest dropped down very quickly. On 4 September 2012, Charest had been defeated and he decided to quit. After his resignation, Jean Charest decided to give more time to his family and begin working again as lawyer. At least five law firms have shown interest in his services, especially one in Toronto. At the age of 18 years old, Jean Charest met Michèle Dionne who became his wife. They met while they were studying in Sherbrooke. Michèle Dionne had been considerate as a big part of his career, she has supported and has influenced many of his choices while he was in politics. Amélie, Antoine and Alexandra are their 3 children. This page was last changed on 22 April 2019, at 16:28.